DC blocks, similar to bias tees, block the DC component on an RF/microwave transmission line. 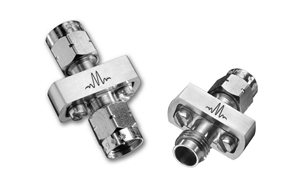 Marki Coaxial DC Blocks feature a special ‘guided wave’ construction in a rugged adapter style jacket to allow for low, flat insertion loss. Electrical Specifications- Specifications guaranteed from -55 to +100°C, measured in a 50-Ohm system.